Tropolism took a vacation to sunny Palm Springs, California. While there we were fortunate to come across Julius Shulman: Palm Springs at the Palm Springs Art Museum. This was our first trip to Palm Springs, and we spent the first few days looking up our favorite buildings in the area, as well as coming across some surprises, such as Albert Frey's 1960 Schiff House, now being renovated. Only after we had done this initial exploration did we discover the Shulman show at PSAM. The show is at once a focused retrospective of Shulman's work (concentrating on only the Palm Springs buildings he photographed) and a survey of great modern buildings in Palm Springs. On display is Shulman's famous image of the Kaufmann Desert House, a picture many architects probably see in their minds when they think of Neutra. Yet equal emphasis is paid to Neutra's Maslon House, stupidly demolished in 2002. The images are supplemented throughout with original architectural renderings, floor plans, and elevations, further emphasizing this as a survey not just of Shulman, but of Palm Springs Modernism. The show is helpfully organized by architect. Our only complaint with the show is its arrangement. Because much of the show is on free-standing partitions, either permanent or specially built for the exhibition, it does not lend itself to wrapping around corners the way a traditional 4-walled room does. Yet the show wraps, and wraps, and it is sometimes impossible to understand where to proceed next to see the rest of that particular architect's oevre. The architects are given large numbers next to their names, yet some of the architects are displayed out of numerical order. These are minor issues, but from the standpoint of anyone who has designed exhibitions, it is bewildering to see such freshman flubs at all. Even though the architectural celebutantes are well-represented (Richard Neutra, Albert Frey, and John Lautner), lesser known architects are given equal time (Paul R. Williams and A. Quincy Jones, Dan Palmer and William Krisel, Donald Wexler, William Cody, and E. Stewart Williams). There are fewer masterpieces among this group, but they arguably have had a more powerful voice in shaping the character and culture of modernism that exists in Palm Springs. They shaped it both through the sheer number of good-to-great buildings in the Coachella Valley, and the breadth of their talent, imagination, and interests. E. Stewart Williams is case in point: he designed the 1946 Frank Sinatra House, the beautiful 1954 Edris House, and the equisitely detailed 1957 Santa Fe Savings and Loan Building. (which we drove by a dozen times on our long weekend) and, of course, the building housing the exhibition. There are few places in suburban America that can lay claim to this much per-capita Modernism. Special thank you to Stephen Monkarsh, proprietor of Palm Springs' best collection of architectural books, who directed us to the exhibition. 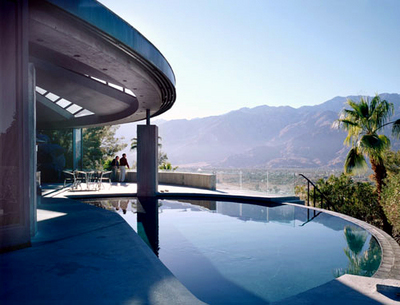 Julius Shulman: Palm Springs is also a great book, available on Amazon.